The European Union and Canada slapped tough sanctions on Iran's key energy sector in a bid to block its contested nuclear programme, and the United States said the punitive steps would bite. European foreign ministers formally adopted the new measures Monday on the oil and gas industries, going beyond a fourth set of UN sanctions imposed over Iran's refusal to freeze uranium enrichment. Canada then followed suit. The moves, which follow similar sanctions imposed by the United States, are aimed at reviving moribund talks between Iran and six world powers -- Britain, China, France, Germany, Russia and the United States. "Today we sent out a powerful message to Iran, and that message is that their nuclear programme is a cause of serious and growing concern to us," EU foreign affairs chief Catherine Ashton told reporters. "But our objective remains, as I have always said, to persuade Iranian leaders that their interest is served by a return to the table. Sanctions are not an end in themselves," she said. 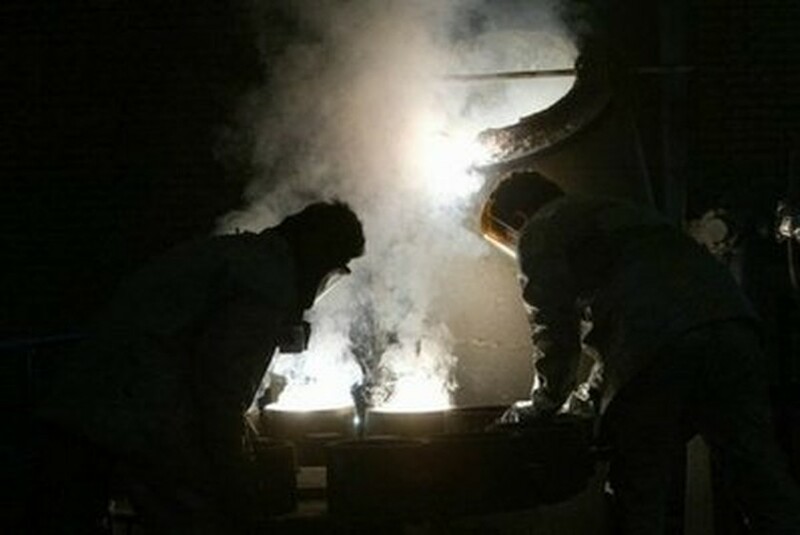 File photo shows Iranians working at the zirconium production plant, part of the nuclear facilities (UCF) in Isfahan, Iran. Iran's foreign ministry however said the sanctions were not "an effective tool" and would only serve to "complicate" its showdown with the West. Oil Minister Masoud Mirkazemi said they would have no impact on oil production because European oil firms had "no presence" in Iran's energy sector. The EU measures include a ban on the sale of equipment, technology and services to Iran's energy sector, hitting activities in refining, liquefied natural gas, exploration and production, diplomats said. New investments in the energy sector are also banned. Iran is the world's fourth largest producer of crude oil, but imports 40 percent of its fuel needs because it lacks enough refining capabilities to meet domestic demand. The Iranian banking sector was also hit by restrictions, forcing any transactions over 40,000 euros (52,000 dollars) to be authorised by EU governments before they can go ahead. The United States hailed the move, saying the steps "underscore the international community's deepening concerns about Iran's nuclear program." State Department spokesman Philip Crowley said: "We've already begun to see the impact of the sanctions as companies around the world refuse to do business with Iran, rather than to risk becoming involved in Iran's nuclear program and other illicit activities." The identities of those hit by the new measures will be published in the official EU journal on Tuesday. Diplomats said 41 individuals and 22 government entities were concerned. Canada's sanctions take aim at Iran's energy and banking sectors, as well as chemical, biological and nuclear activities, Foreign Minister Lawrence Cannon said. Canada will also bar all new investment in Iran's energy industry, particularly crude oil refining and liquefied natural gas. Ashton has exchanged letters with Iran's chief nuclear negotiator Saeed Jalili in recent weeks in a bid to revive talks, and Tehran has indicated that the talks could resume in September. The last high-level meeting between Iran and the six world powers was held in Geneva in October 2009 when the two sides agreed a nuclear fuel swap that has since stalled. Western powers have demanded that Iran suspend its uranium enrichment programme, fearing that Tehran would use the material to build a nuclear bomb. Tehran says its atomic programme is a peaceful drive to produce energy. Iran's actions "are bringing it closer and closer to possessing nuclear weapons which represents a threat," said Cannon. British Foreign Secretary William Hague said: "Iran's ongoing refusal to engage constructively on this issue leaves us no option but to implement these sanctions." Israel welcomed the sanctions and urged other countries to follow suit. Iranian Foreign Minister Manouchehr Mottaki said at the weekend Tehran was ready to hold immediate talks on a nuclear swap deal brokered by Turkey and Brazil in May. World powers have given the cold shoulder to that deal, a counter-proposal to the October agreement.